It’s Down syndrome Awareness Month! It’s a month where those of us in the community raise awareness and celebrate our loves who happened to be born with a little bit extra. One way I like to do this is to participate in our cyber-buddy Tricia, over at Unringing the Bell‘s creation- 31 for 21. I’m taking part again this year because Disability Awareness and Acceptance has always been a part of my make-up. But in February 2009, it hit closer to my home and heart. When the Quail came to us in all her glory we learned post-natally about that little bit extra residing on her chromosomal pattern in every cell of her being. And we believe that about her with all of our hearts- she isn’t lacking a thing. She’s all there. And a little bit extra. Just like her big sister, who very few, other than the geneticists in our lives; would describe as “typical”. She’s a wonder. We’re blessed to get to witness their growth on a daily basis. That said, I don’t think I’m going to go on rants about stereotypes, or resource listings or basic Down syndrome information this year. That’s already out there. Check back in my archives to the month of October in 2009 or 2010 for my versions of that. I would reckon they still hold water. 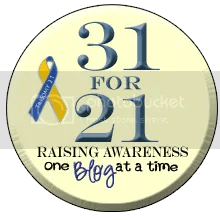 Or for more up to date information go visit our cyber-pals who are also participating in 31 for 21 and get schooled by them with a personal touch. I know I plan too and Tricia will keep a list of where to find them! This year I’m going to do something more simple. I’m going to share 31 ordinary things about my extraordinary girl. I’ve spent over 2 years going on about what a wonder she is and have decided that my contribution to Down syndrome Awareness efforts will show the beauty of how ordinary life continues when you have someone with a little something extra in your life. “31 ordinary things about my extraordinary girl” should be the title of your posts. And you too, Cole, are extraordinary.